The Sfair round bowl, a clever play on words, for a uniquely clever design. 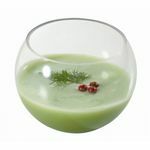 The sphere bowl is a new edition in the foodstuff canape display range. The contours of this mini bowl ensure food presented within looks elegant from all angles. 60ml Clear Sfair Round Bowl x 5 has not been evaluated yet.